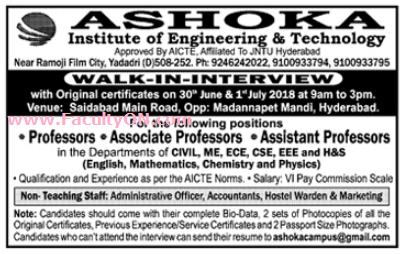 Ashoka Institute of Engineering and Technology, Yadadri has advertised in the DECCAN CHRONICLE newspaper for the recruitment of Professor / Associate Professor / Assistant Professor Plus Non-Faculty jobs vacancies. Interested and eligible job aspirants are requested to walk-in on 30th June 2018 & 01st July 2018. Check out further more details below. About College: The Ashoka Institute of Engineering and Technology is committed to creating leaders who are not only rigorous professionals but also good human beings. In addition, the teaching faculty of the college is well-qualified, consisting of scholars from research and industry backgrounds, providing acceleration to the ascendance of AIET in becoming one of the best private engineering colleges in India. How to Apply: Interested and eligible candidates are requested to appear for Walk-in interview with their updated CV along with 02 set of photocopies of certificates, previous experience / service certificates and 02 recent PP size photos to the following Walk-in address. Candidates who can't attend the interview can send their resume to the email address given below.